The exhibition "Craft & Industry" juxtaposes the industrially made “Fabricate” woven light shades with new additions to the “Shelter” collection, a series of hand-made textile furniture pieces. The exhibition design is tailored to the gallery space: a loft-type room, split in two equal parts facing a rooftop terrace. The new additions of the “Shelter" collection (craft) is presented first upon entering the space. The daybed, blanket and room screen are accompanied by experiments from the design process. Secondly the industrially made "Fabricate" lightshades are on show. The prototypes are presented alongside elements of the production process and tests from the design development. In both sides of the room the viewer is presented first with the elements of the design process, displayed on the wall facing them. Moving further in the room the complete display of objects becomes clear; an exciting mix of products and process. 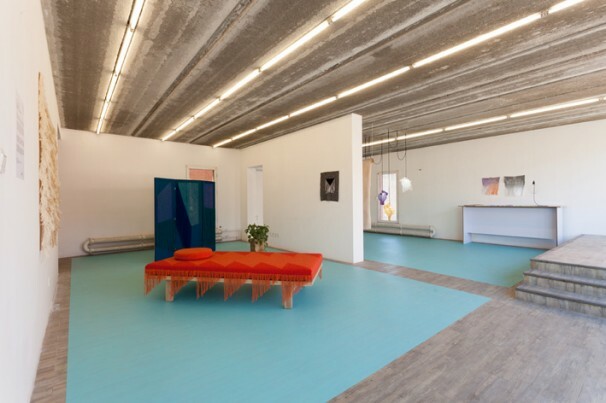 A turquoise floor is used to brighten the space and accompany the colorful objects on display.